Thai curries are so easy to prepare. Well… easy if you buy pre-prepared curry pastes. The curry pastes sold in mainstream shops tend to be rather bland, but the internet offers authentic, imported alternatives. What’s more, their prices are cheap! If you want something hearty but not too hot, I recommend a Hunglay curry. Technically, you should add a cup and a half of water to this curry paste, but the flavour is richer if you add coconut milk instead. We always take Lobo curry pastes and end up with a marvelous one pot meal. Marinade the pork belly in a little soy. Heat some cooking oil in your saucepan (just enough to cover the base). Add the pork cubes and cook for a couple of minutes. Add the curry paste, coconut milk, water, sweet potatoes and bamboo shoots. Bubble away for half an hour. When the sweet potatoes are soft add the noodles. Cook and stir for 5 minutes (the noodles soak up some of that sauce. If you want more of a soup than a stew, add a cup of water when you add the coconut milk. Various supermarkets sell ready to wok noodles. The packets don’t need refrigeration, and only need warming. Good reasons to include them in your rucksack. Shredded bamboo shoots are similarly handy (no need to refrigerate) but if you struggle to find these, substitute with tinned mushrooms and/or tinned water chestnuts. 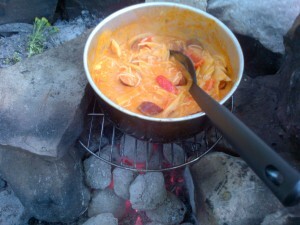 We always have a Thai curry at least once when we’re away camping. This one is probably our favourite. 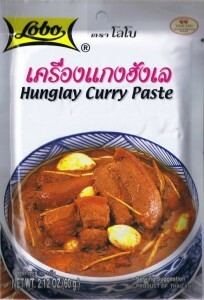 Hunglay Curry originally derives from Burma, but you’ll find it in Northern Thailand and India. There are a wide variety of Thai curries to try and they’re perfect for a flavour full, warming meal of a night time. Lobo also do an outstanding green curry, but beware those of you who buy the jars of paste available in mainstream UK supermarkets. Green curry should be burn your lips hot! Adding more coconut milk does soften the burn, but if you you like a hot curry, you can’t do much better than Thai green! A number of Thai curries derive their name from the colour of the chilli used in the paste. Hence green, yellow and red curries. Add in shredded bamboo shoots, baby sweet corn, sweet or plain potato, sliced pepper, tinned or fresh button mushrooms and the meat of your choice (if you’re confirmed carnivores… we are!). For a little more flavour and authenticity, add a few drops of fish sauce (the Thais use this as seasoning but don’t overdo it! ), fresh coriander and a squeeze of lime, but these really aren’t essential. You’ll find ready to wok noodles in any large supermarket. We prefer bagged bamboo shoots as it saves the weight of tins. Again, you’ll find coconut milk in most supermarkets these days and can also buy it in cartons which are lighter to carry.